Columbus Blue Jackets left winger Nick Foligno, New York Islanders goaltender Robin Lehner and San Jose Sharks center Joe Thornton have been named finalists for the 2019 Bill Masterton Memorial Trophy, which is awarded “to the player who best exemplifies the qualities of perseverance, sportsmanship and dedication to hockey." The local chapters of the Professional Hockey Writers Association (PHWA) submitted nominations for the Masterton Trophy at the conclusion of the regular season and the top three vote-getters were designated as finalists. The winner will be announced Wednesday, June 19, during the 2019 NHL Awards show. There is no doubt the Leafs have the best goaltender in the series, which under normal circumstances wins you playoff rounds. The best goalie doesn’t always win, though — see Tampa’s Andrei Vasilevskiy in Round 1 against Columbus. The hottest goaltender wins. Andersen is better than Rask at this stage of their careers. But will he be hotter than Rask in the final games of what is now a best-of-three series? No doubt, though, Andersen is world-class. Rask used to be world-class. He’s slipped somewhat from his greatest days, but is still an above-average NHL goaltender. And, to date, through four very different playoff games, Andersen has outplayed Rask through the first three games, two of them won by the Leafs. William Karlsson picked up a loose puck in the neutral zone and darted into the Sharks’ end on a 2-on-1 with Reilly Smith. Karlsson put on the breaks, got the puck to his forehand and fed a perfect pass to Smith over the stick of Brenden Dillon. Martin Jones stretched out his right leg, using every inch of his 6-foot-4 inch frame, to get a toe on the shot, preserving the Sharks’ one-goal lead and maybe his team’s season. “Totally what we expected. He’s a heck of a goalie,” Sharks captain Joe Pavelski said. “We believe in this guy. We played the right way tonight and it probably started with him and he led the way out. After he was pulled in Game 4 after he allowed two goals on seven shots in the first period, Jones finished with 30 saves, and the Sharks came away with a gutsy 5-2 win over the Golden Knights on Thursday in Game 5. By now the strategy is crystal clear for the Blues. They should simply forfeit Game 6 Saturday in St. Louis, proceed directly to Game 7 here, clinch the series, and move on to Round 2 of Lord Stanley’s playoffs. Because apparently it no longer is possible for the Blues to lose at Bell MTS Place. They were down 2-0 in the first period Thursday. On the ropes when they had to kill a four-minute high-sticking penalty to Robert Thomas. Within inches of trailing 3-0 when Colton Parayko fell on Kevin Hayes and Hayes’ own stick redirected the dribbling puck away from the goal line. A game-tying goal by Brayden Schenn — moved down to the second line — came with 6 minutes 8 seconds to play in the game. And then the game-winner by Jaden Schwartz with 15 seconds to play. It all added up to a spellbinding 3-2 victory. If the Blues manage to close out this series, it will be a game talked about for years in team lore. Up 3-2 in this best-of-seven series, the Blues can send Winnipeg packing with a victory Saturday at Enterprise Center. The Detroit Red Wings aren’t wasting time welcoming Steve Yzerman back into their fold. Days after the Tampa Bay Lightning, where Yzerman was general manager, were eliminated from the playoffs, the Wings have called a press conference for this afternoon. A tweet all but gave away the announcement: Signs point to Yzerman being named general manager and Holland moving into an advisory role. 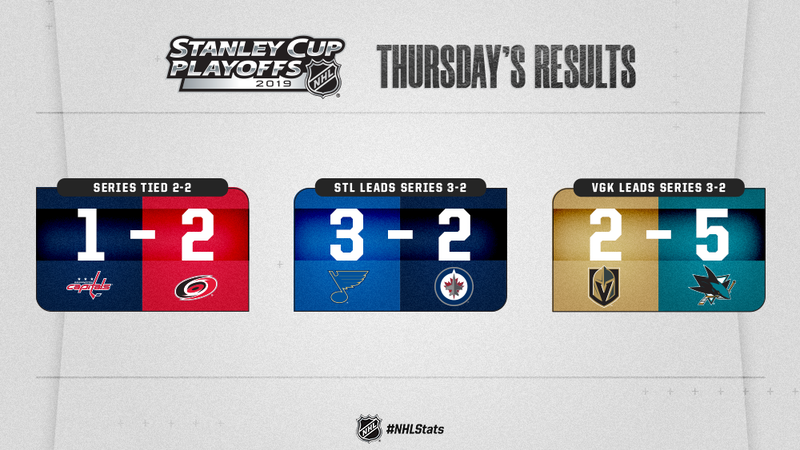 The St. Louis Blues can advance to round 2 on Saturday night. Explanation of the second goal by the Blues is below along with the game highlights. From the entry 'Yes It Is Good Friday And Now A Great Friday- The Captain Returns'. From the entry 'A Bounce Back Win For Martin Jones And The San Jose Sharks'. From the entry 'Chris Chelios On Steve Yzerman's Return'.